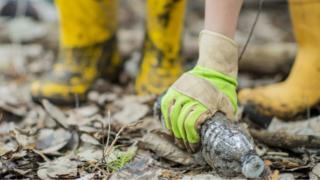 Fines against people who drop litter in Flintshire will be enforced by the council after it cut ties with controversial firm Kingdom Services. Residents were urged to "take responsibility " by the council, which will now hand out fines of up to £75 for littering and dog fouling. Kingdom attracted criticism during its enforcement contract, with staff accused of "heavy handed tactics". One councillor said the new measures were not strict enough. Speaking at a council meeting at Mold County Hall, councillor Derek Butler said: "I think we've gone through a period where people's perceptions are that they can drop things and expect the council to pick it up. "People actually need to be responsible for their own communities." The council will have seven officers responsible for tackling littering and issuing fixed penalty notices. It is estimated £20,000 will be raised each year from the measures, the Local Democracy Reporting Service said. Councillor Carolyn Thomas said residents needed to work with the council. "The approach will be that the council will carry out the appropriate enforcement action against those who intentionally litter," she said. But councillor Chris Bithell said he had "great concerns" about the policy. "I've got concerns that we're going to have seven operatives in the county when we've got eight towns, and that's saying nothing of the villages who deserve a service too," he said. "We've operated the service before in the past and it was not successful."